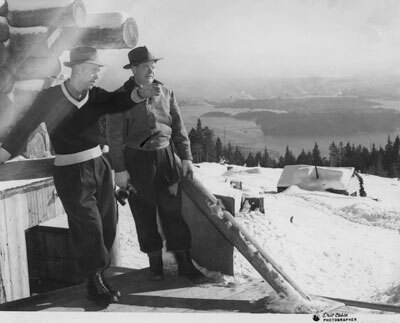 Black and white image of George Thompson and an unidentified companion standing on a wooden platform on a snowy slope on Hollyburn Ridge. In the background there is a view of Lions Gate Bridge, Stanley Park, downtown Vancouver and across English Bay.Accompanying documentation identifies Mr. Thompson as having served as an officer of many civic organizations including being an Alderman of the West Vancouver Council. Scanned December 2011 using Epson Perfection V700 Photo at 300dpi and 100% of original image size. Alternate Versions: Lossless TIF from original scan at 300dpi and 100% of original print. W25.5 x H20.5 cm black & white print on photo paper.